Uncle Rod's Guide to Used SCTs CURRENT VERSION IS 4.01! This is my Guide to buying and identifying old CATs. Go here: http://members.aol.com/RMOLLISE/index.html and choose it from the menu you'll find on my homepage to download a copy. It' s a large .pdf, so allow plenty of download time! The Manual Project Please Help! 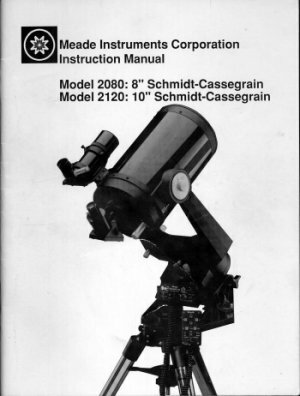 I'm collecting manuals for the Old Telescopes, since many buyers of used instruments discover that the manual for their scope has walked away a long time ago. Neither Meade nor Celestron will normally be able to supply you with a manual for an older scope. But I can! My collection is growing all the time thanks to friends of the CAT Project. Contact me RMOLLISE@aol.com for further information. I'm also collecting catalogs, advertising material and other data related to the scopes! "THE CAT PROJECT IS A FREE SERVICE OFFERED TO ALL MEMBERS OF THE CATADIOPTRIC TELESCOPE USING COMMUNITY. HOWEVER, DONATIONS OF ALL KINDS ARE GLADLY ACCEPTED!"